Flow drill screw (FDS) joining is a modern mechanical fastening technique for connecting metal parts in lightweight car structures. Finite element simulation of FDS joining probably is one of the biggest challenges for CAE engineers in automotive applications. This is mainly because finite element methods inevitably encounter utmost numerical difficulties associated with meshing issues in modeling the extensive plastic deformation and material failure taking place during the thread forming operation in the FDS driving process. 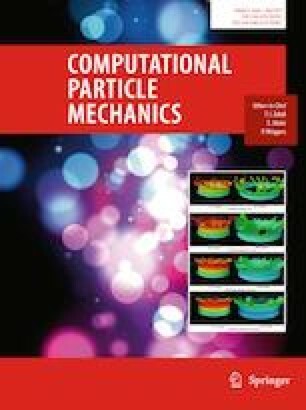 This paper presents a FDS thread forming simulation using a new particle method based on authors’ recent work (Pan et al. in Comput Mech, 2019. https://doi.org/10.1007/s00466-019-01673-8). Different from other particle stabilization methods which are obtained by modification of the variational equation using either residual or non-residual stabilization terms, the present method introduces a novel velocity smoothing algorithm to achieve the stabilization effect. It is shown that the semi-discrete equation based on the smoothed velocity field is consistently fulfilling the conservation of linear and angular momentum. Since the new method does not require stabilization terms, it avoids the fundamental difficulty inherent in the stabilization stress computation, thus computationally more efficient. Finally, the stabilized formulation is supplemented with the adaptive anisotropic Lagrangian kernel and bond-based failure criterion to extend the application in severe deformation and material failure analysis. Three numerical benchmarks including one FDS thread forming simulation are utilized to demonstrate the effectiveness of the new approach. The authors wish to thank Dr. John O. Hallquist of LSTC for his support to this research. The support from Ford Motor Company is also gratefully acknowledged.